"Should I prune my herbs now? does pruning plants in pots require a different approach?" For the benefit of our readers: The answer refers to spring. That's an interesting question, but just before I answer it, I would like to tell you two things: 1. your vertical herb garden is a beauty. I love it. well done!! 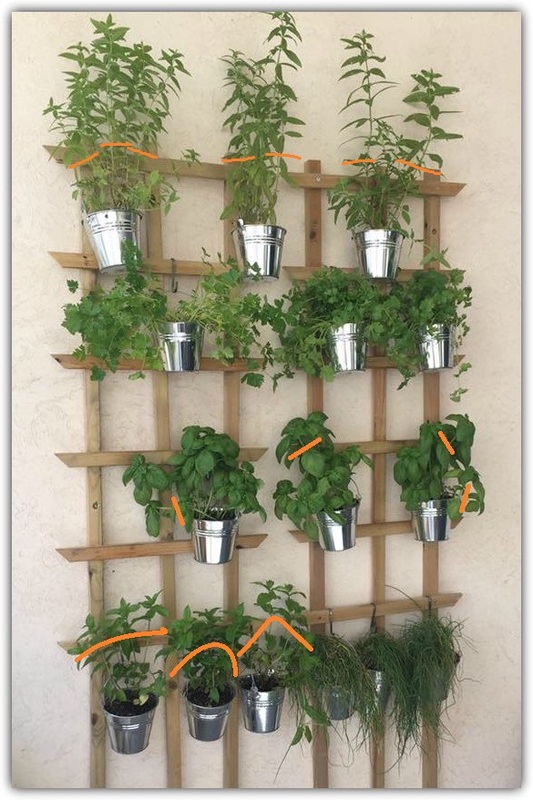 2. if I may, most of my readers already know that I notice all the small but important details, so before we prune anything, lets talk about a few things I am certain will improve your vertical herb garden and even prevent potential damage. Once we cover these important issues, we'll get to pruning. Get a bag of small lava stones or clean white gravel. Gently pull the herbs from the can. Drill at least two holes a the bottom of each can, with a diameter at least the width of a pencil. Cover the bottom of each can with a one inch layer of gravel / lava stone. Replant the herbs. Make sure you have enough garden soil to add at the top. Water the herbs, but stop as soon as you see water coming out of the bottom of the can. Now let's prune. Scroll down for pruning guidelines. Avoid cutting all the stems at once, cutting either outer or inner stems is better. Avoid cutting too low, keep it at 1 - 2 inches above the soil. And if your parsley grows flowering stems, feel free to cut them too. That's it. Your done. I hope I was of help. Please send me follow up pictures from your vertical herb garden as soon as it recovers, or if you have any other questions, please don't hesitate to write back.